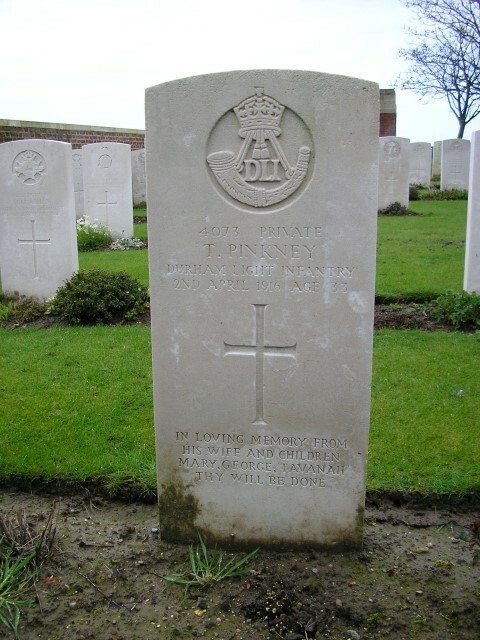 4073 Private Thomas Pinkney, 6th Battalion, the Durham Light Infantry was killed in action 2 April 1916 and is buried at Chester Farm Cemetery, Ypres, Belgium. He was 33 years old and is commemorated on the Cockfield War Memorial. Thomas Pinkney enlisted into the Durham Light Infantry at Bishop Auckland and was given the regimental number 4073. He joined the 6/DLI although the SDGW source records him as serving with 1/8 DLI. 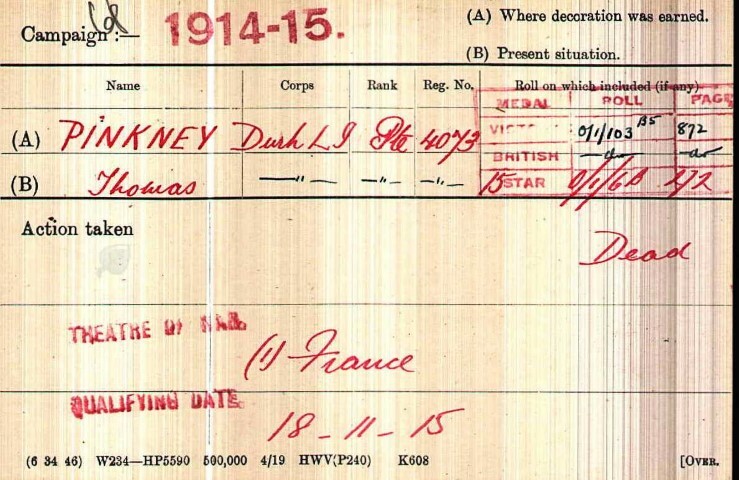 Private T. Pinkney entered France 18 November 1915. The service details and war diary of 6/DLI have not been researched but the following account offers good detail of the circumstances surrounding the death of Private T. Pinkney. When Private T. Pinkney entered France, 6/DLI was not in the line but was billeted at camps near Bailleul, France close to the Belgian border and the Ypres Salient. 6/DLI was to see action between 17 December 1915 and 4 April 1916 at the Salient, Sanctuary Wood and the Bluff. 17 December 1915: 6/DLI marched to Steenwerck then entrained to Poperinghe then marched to Dickebusch where the camp was a disgrace. 18 December: relieved 6/Royal Scots, W Company in Canal Dugouts, X Company in Maple Copse, Y Company in Sanctuary Wood and Z Company in Redoubts 2, 3 & 4. 19 December: heavy bombardment and enemy attack to the north of Hooge and to the north of the trenches occupied by the 6/DLI. 20 December: the bombardment continued and 6/DLI lost 6 men killed and 12 wounded in this bombardment. During this first phase of front line duty, 6/DLI suffered 1 officer and 8 ORs killed and 1 officer and 45 ORs wounded. This pattern continued throughout January and into February and casualties were low. 14-15 February: Germans recaptured the Bluff. 151 Brigade was in Reserve and standing to for a counter attack if needed. 2 March: the Bluff recaptured by British forces. 23 – 26 March: the Bluff trenches. 2 April: enemy bombardment reached a crescendo. Between 17 December 1915 and 4 April, 6/DLI lost 1 officer and 42 ORs killed in action or died of wounds. This source records no casualties for 2 April 1916 but H. Moses informs that there were 6 men killed or wounded. Private T. Pinkney is recorded by the CWGC as serving with 6/DLI but SDGW records him with 8/DLI, informing that 7 ORs of that battalion were killed in action 2 April 1916. Unless there were transfers during operations which would be difficult for SDGW to record, it appears that SDGW is inaccurate with regard to the men serving in these battalions at this time. 4073 Private Thomas Pinkney was awarded the 1914-1915 Star, the British War and Victory medals.